Oh boy - I’m sure a lot of you weren’t expecting Modern Horizons. Okay, maybe some of you were, but it’s still pretty exciting! I want to take this article to clear up any misconceptions about what can and cannot be in the set, look at historical trends of Summer supplementary sets, and give you some advice about what I would do in this position. Let’s start off by breaking down the original announcement. This set will include 249 new cards to Modern and 5 basic lands. All of these cards will be Modern, Legacy, and Vintage legal but not Standard legal. Some number of these cards will be new and some will be reprints but none of them are currently Modern legal. Wizards of the Coast no longer announces an MSRP for products but we can see from this announcement, they still kind of do. Packs will cost $6.99 on Magic Online which means that the paper prices should be very similar to a Masters set. For reference, packs of Ultimate Masters were $6.99 on Magic Online and about $14 MSRP in paper. I don’t expect the packs to be quite as expensive as Ultimate Masters but they certainly won’t be $3 like Battlebond or Conspiracy. And the last thing we know for certain is that spoiler season won’t start in earnest until the end of May. Historically, this set will be unlike any other and also very similar to a few at the same time. Among the most important things to be mindful of is the type of release and the time of releas; we can derive some expectations based on that. Products released during June through August are typically the lowest selling products of the year because the vast majority of Magic players live in the northern hemisphere and enjoy summer during that time. When the weather is warmer a lot more people will enjoy doing things other than sweating it out at their LGS. Historically speaking, these sets have some very popular cards that tend to be very difficult to find and very expensive. While it’s not an exact analogy, you can see from the price tag of Expropriate, Selvala, Heart of the Wilds, and Recruiter of the Guard that even cards that are pretty niche can be quite popular. Most of those cards are Commander exclusive cards and you can only play 1 copy and they’re still really expensive. Conspiracy: Take the Crown is a little bit of an oddball because the drafts matters cards are basically “nothing” in the packs because their resale value is negligible. If you look at Battlebond which contained more “normal” Magic cards, Doubling Season is still the most expensive card in the set at $38. It’s down about $20 since its peak but it’s still never actually been lower than this either. The new cards only in that set are also creeping up. 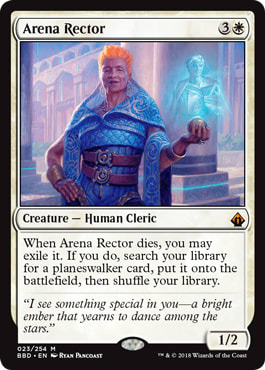 Arena Rector and Archfiend of Despair are casual only cards that still command a $14 price tag. The lands are all between $5 and $12 and are worse than the Khans of Tarkir gain life lands outside of multiplayer Magic. There is just not a lot of this product available and not a lot gets opened during its release. What does this mean for Modern Horizons? New cards might be scarce, reprint cards may get more expensive, and your deck may end up being harder to complete than easier. At the end of the day, this kind of release into Modern is something people have been asking for but I’m not sure they’re ready for what is actually going to happen. This set will contain some new cards and you can bet if they are good in Modern they will be very expensive. 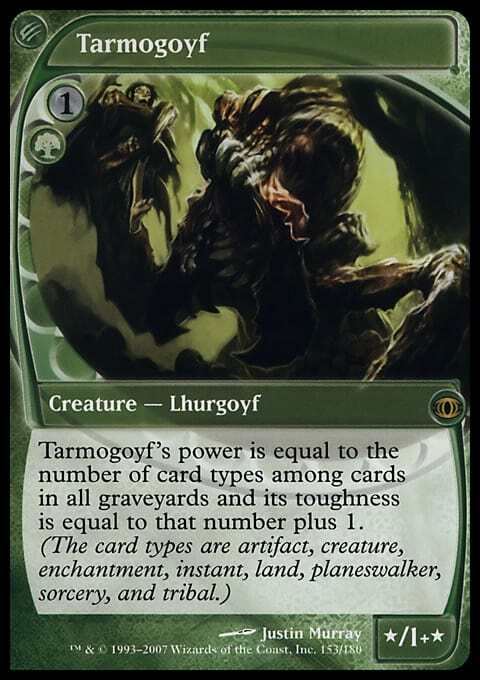 Tarmogoyf is still $50 despite being in 4 Modern Masters sets and Future Sight. I can only imagine what will happen if any of the mythics in this set are archetype defining cards. I’m expecting this set to increase the cost of Modern overall. Decks that gain cards will gain more expensive ones and decks that don’t will likely stay the same. And while I’m saying this, it always depends on the rarity of the cards. I’m not going to make predictions about what’s going to get reprinted but I’m pretty sold on the idea that Counterspell will be in this set. Counterspell is worth about $1 depending on the set and even with its inclusion it likely won’t rock the boat much. Maybe the Jace Spellbook version will see a tick up and you’ll see a few more beta ones in display cases for a little but there are so many Counterspells in existence that it likely won’t matter. Things I’m worried about are cards that could be reprinted as a rare or a mythic and were previously a rare or a mythic. Again, I’m not trying to say this card is likely to be in the set, but a card like Wasteland could be astronomically more expensive than it is now if it’s included in Modern Horizons. Right now the demand for a lot of Legacy and Vintage legal cards is pretty shallow. Not many people can afford the entirety of a Legacy or Vintage deck so outside of some collector value and small overlap with Commander, there is not a ton of demand. Although there is not a lot of demand, there is also not a lot of supply. Right now Mother of Runes is $2.50 but if it’s reprinted as a rare or uncommon in Modern Horizons does it instantly become $10-15 because it’s a great addition to the Humans deck? Right now the only thing I can suggest people do is to finish purchasing the pieces of your deck you know you need and think about if there is a Legacy version. If you want to play Humans, acquire all the currently legal Modern cards together in a cart and just buy them. If you want to try to future proof yourself against the possible rise in card prices that will come with Modern Horizons then take a look at analogous decks in Legacy and Vintage. You can’t prepare for new cards but if you can save a few bucks on old ones then you won’t regret it. To use Humans as an example, the major differences between the Modern and Legacy decks are Wasteland, Karakas, Palace Jailer, Sanctum Prelate, Imperial Recruiter, and Mother of Runes. While all of these cards are very different levels of investment, most of them won’t change much if they don’t get reprinted so you have little to lose by buying early. You play Merfolk? Look into Flusterstorm, True-Name Nemesis, Force of Will, and Back to Basics. You play Burn? The only major differences are Price of Progress, Chain Lightning, Fireblast, and Sulfuric Vortex. At worst, by preparing yourself for the addition of these cards to your Modern deck, you are also preparing your deck to be Legacy playable. With the new cards, well, we’re just going to have to wait. It seems like some could be quite good but some are also just there for non-Modern players. I don’t think Serra is likely to be a Modern all-star but it will fill many kitchen tables with glee. Similarly I’m not sure how much of Cabal Therapist is good and how much of it is just for the joke. It’s possible we get similar but functionally different cards too. Is Daze too good if you have to return two Islands or it costs three mana? We won’t know until we have more information in May.